We all want to feel comfortable, focused and at ease in all the environments in which we live, work, learn and socialize. Everyone has preferences for the various sensory experiences such as color, sound, scents, texture and the options available for movement and activity. For some individuals, these preferences are more extreme to the point that certain sensations can actually be painful, distracting and confusing. 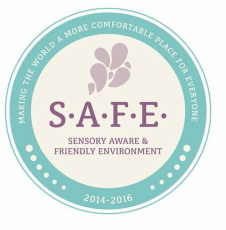 SAFE is a program under development to assist businesses and organizations in making their facilities and services more sensory aware and friendly. More information on how to participate in this program is coming soon!